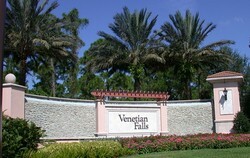 Venetian Falls is the premier 55+ community in the area. The community is a mixture of paired villas, 4 plex garden villas and single family homes. Floor plans range in size from 1453 sq ft villa up to 2550+ 2 story single family home. The community is maintenance free. The Community Center consists of a grand entrance sitting room, internet cafe, card room, pool room, large banquet room and a state of the art fitness center. This all surrounds the resort style heated pool, heated resistance pool and heated spa. The bocce ball courts are used by league competitors. Prices range from $245,000 - $368,500 for villas and $335,000 - $353,000 for single family homes. Pelican Pointe Golf and Country Club is the destination for avid golfers. This gated community boasts a 27 hole golf course designed by renowned designer Ted McAnlis as well as a spectacular 22,000 sq. ft. clubhouse. The Country Club has formal and informal dining. The Pro Shop is well stocked and staffed with knowledgeable individuals. A mixture of condos, detached and attached villas and single family homes can be found at Pelican Pointe Golf and Country Club. The entire community is maintenance free because the landscaping cost is included in your monthly fee. All the homes and villas surround the beautiful golf setting. For the tennis buff, the community offers lighted hard true tennis courts. The market in Pelican Pointe is existing homes. The homes were built by Arthur Rutenburg and Sam Rodgers Home Builders. The builders instill a degree of confidence in each home buyer thanks to the quality, attention to details and architecture of each home. 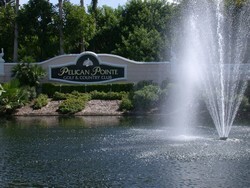 Pelican Pointe Golf and Country Club is located on Center Road half way between Route 41 and Jacaranda Blvd. with easy access to all major arteries (Route 41 and Interstate 75). Prices range from approximately $229,000 up to $525,000. Villa inventory is in the $229,9000-$287,900 and homes from $299,000-$525,000. 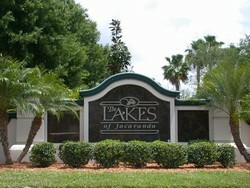 Lakes of Jacaranda is a premier community built by J&J Homes. A variety of home plans are available but the most popular plan is the “Aruba” model which has a Living Room and Family Room. Single family homes with tile roofs are the architectural design of this community. The home sizes range from 1,450 sq. ft. up to 3,100 sq. ft. You will find young families, business professionals and retirees living in this community. A series of lakes highlight the community, which enhances the Florida lifestyle found at The Lakes of Jacaranda. The clubhouse contains a meeting room and has an adjacent heated community pool. Hard true tennis courts are available for all residents. A walking/jogging path offers a scenic exercise trail along with sidewalks which connect the entire community. New construction is almost completed. The unbuilt vacant lots are privately owned. The housing market in The Lakes of Jacaranda is in the resale of existing homes. Lakes of Jacaranda is located between Route 41 and Center Rd. off of East Venice Blvd. Price range from $314,900 - $476,000. The community of Woodmere Lakes offers a deed restricted lifestyle. There are 176 single family homes, many with pools and the market consists of resale only. A mix of retirees, young families and business people enjoy the relaxed atmosphere of this small community. On any given evening, you will find a number of residents walking the sidewalks of the community and chatting with neighbors and friends. There are 4 storm water retention ponds and one preserve in the community which are maintained by the association along with the common grounds at each of the entrances to Woodmere Lakes. The entrances give a secure, welcoming feeling to all residents and visitors. The ponds were restord in 2007 through the Sarasota County Neighborhood Grant Program. Each homeowner is responsible to maintain their homesite keeping in mind the landscaping and homesite maintainance standards of the community. This keeps the yearly dues at a reasonable amount. Want to save gas and get some exercise...then take a stroll when you need to shop. Access to shopping is just across from our entree way along Woodmere Park Boulevard. The landscaping and the large pond that is located between Woodmere Lakes and the shopping mall keeps traffic noise almost non-existent. 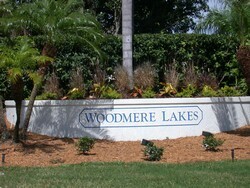 Woodmere Lakes is centrally located between North Port/Port Charlotte and Sarasota. It is a short distance to Route 41 for local travel and 5 minutes to Interstate 75 access. If you love the beach, then you will enjoy the 10 - 15 minute drive to the Gulf Coast Beaches. Prices range currently from $269,000. 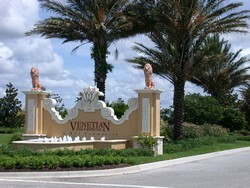 Venetian Golf and River Club is one of the premier communities in Venice. This gated community is rich with the finest amenities, deserving of every homeowner. Starting with a spectacular golf course designed by renowned architect Chip Powell, to its opulent River Club which includes two community pools, an extensive fitness center which contains an aerobic studio, a fully stocked pro shop, River Club Dining and a wilderness walking trail that is part of the 70-acre Nature Park nestled along the Myakka River. The championship golf course is a challenging 18 holes designed around water and a natural preserve. The golf clubhouse is an oasis to visit after an exciting round of golf! There are also 6 clay tennis court which are lighted for evening play. The pools are resort style in size and layout. One pool is a lap pool for the exercise conscience. The other pool is heated and surrounded by lounge chairs with a tiki bar serving food and drink. You couldn’t ask for more! The homes were built by WCI builders. Homes range in size from 1,082 sq. ft. up to 4,902 sq. ft. The condos are either 1,783 sq. ft. or 2,450 sq. ft. Each condo building has 4 units and the larger 2nd floor units have an elevator for your convenience. Venetian Golf and River Club is located just off Interstate 75 at exit 195. Go east on Laurel Rd. and turn left through the entrance portals. New construction is taking place at Venetian Golf and River Club but there is also a resale market available for those who want immediate occupancy. For new construction, it would be my pleasure to introduce you to the staff so they can further answer your questions. Prices range from $229,900 up to $769,000. 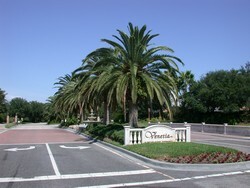 Venetia is one of our newer gated communities. The make up of Venetia is a mix of condos (called Casa Di Amici Subdivision), villas and single family homes. The Clubhouse has a meeting room, kitchen, library and exercise room. The exercise room consists of free weights, exercise machines and locker room facilities. Just outside the clubhouse is a magnificent community pool and lanai with plenty of room to relax and sun yourself. Tables with umbrellas, chairs and lounges are available on a first come first served basis. This creates a social and comfortable setting. Tennis courts are located next to the clubhouse and are a hard true surface. Venetia is built out - meaning that the homes and condos available are in the resale market, not new construction. Venetia is located between Route 41 and Route 776 with the main entrance on Jacaranda Blvd. Price ranges $205,000 - $229,000 for condos, no villa's at this time and from $318,900 - $535,000 for single family homes.